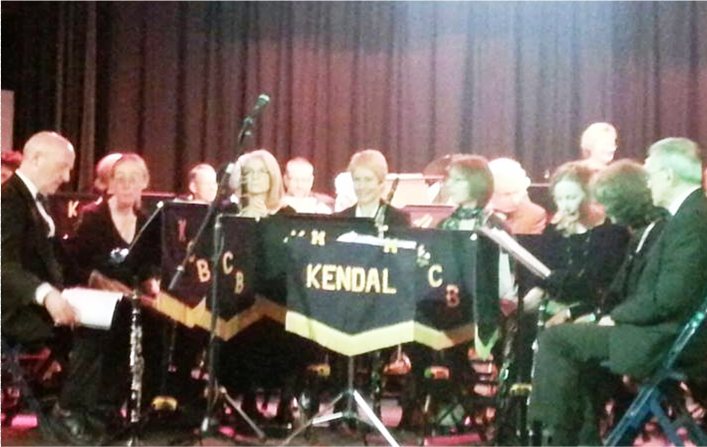 Concerts at Burneside Institute are becoming a regular commitment for Kendal Concert Band. We returned to the venue on Friday 17th May and played to a full house including plenty of locals, boosted by friends and family of KCB. The music was varied with the first half featuring two pieces by Adele (Someone Like You and Skyfall Theme), The Music Makers (a traditional march), Dance of the Mirlitons and a lively rendition of Mambo No. 5. The second half began with the Jazz Band’s debut public performance, led by Solo Clarinet player, Peter Bayliss. The band played 3 numbers: The Locomotion, Good Times and Rock around the Clock. The music went down very well with the audience swaying in their seats and the Institute’s barman displaying some excellent dancing skills at the back of the hall! The Concert Band regrouped to round off the evening with 4 more pieces, including a Clarinet feature and ending with an epic compilation of tunes from the classic film ‘Zulu’.